Have you heard of the ArchivaLife Lifetime Memory Keeper? I hadn't until just recently. The "Classic" version is a set of 2 albums that come with a storage case. The first album is a 12"x12" scrapbook and the second album is one with pre-printed fold-out pages where you record (write) your memories. That's the gist of it but as is so often the case, the devil is in the details. And in this case, the quality is in the details too. Allow me to tell you in detail a little more about these albums. To begin with, you can't help but be impressed with the look and feel of these albums. They aren't leather on the outside but you'll wonder if they are. They have a very classic, expensive, and durable feel to them. The inside lining of the covers looks and feels just like suede. The albums look and feel like a high quality product right from the start. The two albums fit nicely in the matching storage box that comes with them. Again, very well constructed, looks attractive and feels substantial. It's quite heavy. Now let's take a look at the individual albums. Inside the scrapbook album there are 13 plastic sleeves each with a sheet of archival paper in them. If you're in to digital scrapbooking like me, you can create your pages, have them printed, and slip them right into the sleeves. If you prefer to hand make your scrapbook pages you can do that as well. 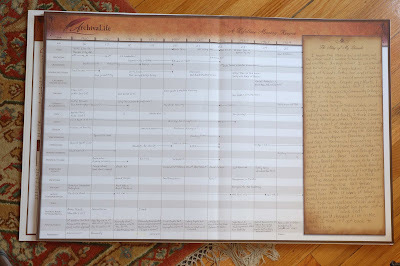 The basic idea is to create a 2-page spread for each decade of your life (the other album is based on recording your memories by decade). Personally, this is how I tend to think about people's lives anyway. When my mom died, I created a scrapbook page for each decade of her life to display at the funeral home. 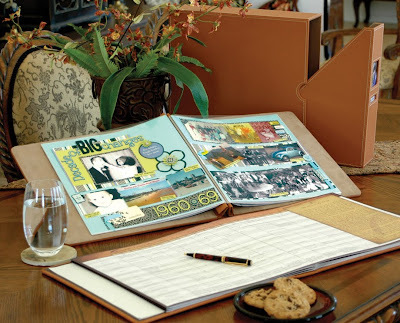 This scrapbook album would have also been a lovely and classy way to display those scrapbook pages! The second album is called "LifeLines" because it's organized as a timeline of life events. The timeline is blank of course, you fill in the events. It's not just a series of blank pages to write your memories over time though. The left side of each 2-page (1 decade) spread has a vertical list of specific topics... age, home, education, occupation, significant other, children/grandchildren, parents/siblings, friends/acquaintances, pets, faith, health, volunteerism, affiliations, hobbies/interests, sports/activities, memorable events, vacations, autos/transportation, favorite books/songs/TV shows/movies, news and events, President. These topics allow you to show changes in these topics over time. You have a small 2-line space to briefly record changes. On the right side of the 2-page spread there is an area where you can write a synopsis of each decade of your life. And on the back of each page there is a lined area where you can write in more detail about the changes/events you recorded on the front of the page. The pages in the LifeLines album are printed with an aged look but the paper is thick and seems very durable. Everything about these albums seems to be durable and high quality. They are just beautiful! Together, these albums are intended to record a person's life events in lieu of a memoir. Not everyone is inclined to write a memoir you know. Take my mom, for instance. She was a professional typist and worked for R.L. Polk publishers for many years. So she was very capable of typing up a story of her life in autobiographical form, memoir, whatever. But did she? No, even though I asked her many times to do just that. Her response was always the same, "Who would want to read about my life?". And yet, after my daughter was born, she happily filled out essentially a pamphlet version of "the story of my life" for her new grandchild. That little booklet had prompts like, "where I went to school" with just a very small space for a response. But you know what? She conveyed all sorts of information in that little booklet that she had never told me before. I can only imagine how much more information I would have about the details of her life if I'd given her an album like LifeLines! So anyway, I really like this product. Can you tell? And the beauty of it is, it doesn't require any use of technology. Not that I mind technology, but my mom struggled with it. She would have had no trouble with LifeLines though. This would have been her "cup of tea" as they say. Because I believe in writing a balanced review, I will mention that there are a few things I didn't care for and would have done differently if I were designing the Memory Keeper. However, these few things would not stop me from ordering and enjoying the Memory Keeper or giving one as a gift. The scrapbook album has a window in the front cover where you can insert a photo or a title page for the album. The window is roughly 4"x4". It looks nice enough but I'm not a fan of album windows. It's always a bit of a hassle trying to find just the right photo or title, getting it the right size to fit, and maneuvering it into the access slot. And no matter what you put in the window, it won't look as high quality as the album itself unless you have it commercially printed. I would have preferred to have a solid cover with a blank bookplate on the inside of the cover to personalize, title, and dedicate the album. The first page inside the LifeLines album gives you line spaces to identify your parent's names, grandparents, children, grandchildren, etc. But when it comes to life partners there's only one line space allowed for "Spouse". This makes it awkward if you never legally married your life partner or if you had multiple spouses. I wish it had been better thought out for more flexibility. On the decade pages within the LifeLines album, the column on the left with the topics to address has no blanks where you could write in something you would like to track over your life that doesn't fall into the other categories... gifts received or collectibles acquired over your lifespan come to mind. I would have liked to have had a separate space for commenting on holidays separate from memorable events too. I wanted to get another opinion of the Memory Keeper so I asked my friend Cheryl to come over and check it out. Her first reaction was the same as mine, "It's heavy!" And that it is. Her next comment echoed my next thought as well, "It's very nice quality, isn't it?". That's what strikes you most about this product when you first see it. It's substantial and classy. When Cheryl saw the inside she liked what she saw too. It really is a cool product! I'm not aware of anything on the market that puts together a time line of a person's life with photos and text in such an attractive and complete package. It would make a very nice gift to yourself or someone you love. And as a genealogist I sure wish I had a completed Lifetime Memory Keeper done by ANY of my relatives or ancestors! The "Classic" version includes both albums and a storage box for $125. The "LifeLines" album is also sold separately for $49.99. You can order and get more information at ArchivaLife.com. If you are interested in purchasing a Memory Keeper from ArchivaLife.com you can get free shipping and the company will donate $10 to Foundation for Women for every order received. Your code to enter at checkout is: GeneShip .